Famous Kholui Master Sergey Zakharov has painted this masterpiece based on the interesting tale "The Hump Backed Little Pony". The depth and accuracy of Zakharov's painting finds itself at the apex in contemporary lacquer painting circles, and his intricate compositions are favored by many collectors. He is also highly respected in Kholuy, and sets a high standard for aspiring artists. His works are featured in many lacquer art books and displayed in the Museums in Russia. This box is an exeptional piece of his artistry! The artist has painted on each of the surfaces of this five-sided casket. Each scene depicted here shows a different adventure. One of the scenes of this busy composition on the side of this box, we can see the end of the story, when Ivan have to jump in there barrels/jars. Near them the artist depicts Hump Backed Little Pony, who is the faithful friend of Ivan. In the beginning of the story Ivan caught the magic mare that trampled down wheat on his father's field. This mare promised Ivan to present three foals in exchange for freedom. Later two of these foals turned into the steeds with golden manes depicted here, and the third one turned into the Humpbacked Little Pony. All around this scene the artist paints people of the kingdom and the tsar looking surprisingly at Ivan's activity. They have never seen such beautiful animals before! Zakharov paints Ivan riding his faithful friend, the Humpbacked Pony. Ivan holds the golden feather of a firebird that later becomes the reason of his first errand: he'll be obliged to catch the firebird for the old, greedy tsar. There is the tent with dinner and a jar of wine inside that Ivan has erected to lure and capture the Tsar-Maiden who is boating nearby. There is the huge whale whose back is covered with forests, meadows and villages. This huge monster will help Ivan to fulfill his next errand: he will have to bring the ring of Tsar-Maiden, lost somewhere on the bottom of the ocean. The entire surface of the box is filled with wondrous detail. Zakharov's steady hand is able to create minute elements that are at first invisible because they blend so well with the overall scene. Close inspection must be given this piece in order to appreciate all of its complexity! Sergey Zakharov uses here a palette that is characteristic of his work. Warm paints dominate the scene, such as orange, yellow, and red, while darker and cooler paints are used to outline the external frame (consisting of the trees and landscape) inside the composition. This helps to draw the eye towards the main characters, and where the artist shows emphasis with the warm tones. Gold paint is used to aid in the adding of the detail. The use of gold helps to enhance the already bold palette and bring out their true highlights! Gold of different shades is also used to decorate the exterior of the box. Zakharov's precision and ability to paint minute decoration is illustrated in the filigree that frames the scene and the filigree that wraps around the sides of the box. The box is constructed out of paper-mache. 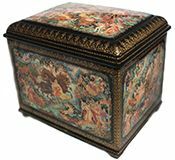 Black lacquer is used to paint the exterior and red lacquer is used to paint the interior of the box. The box has no hinge and rests on a platform that edges the border of the box. The artist wrote the title, Kholuy, and his name under the composition. He does the same on the interior of the lid, but added that this work is his art work and left a year of 2015 and a more decorative signature.